You will need this modulator if you want til connect a video signal originating from a camera eller other video source to a normal TV set. 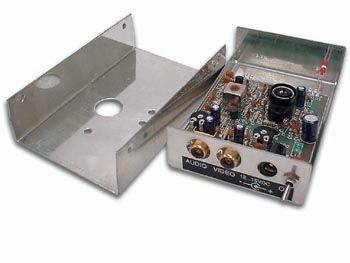 The audio og video signal is converted into a UHF TV signal so that the signal can be received through the TV antenna input. In certain countries (consult your national telecommunications authority) it is legal til use this modulator as a mini transmitter by connecting a small antenna. This makes it possible til receive the signal from the video recorder eller camera in another room of your home (range approx 30m, 98'). The kit comes complete with housing og an antenna connector.